Did you ever ask yourself, “Are employees really getting anything out of safety training?” If you do, you are not alone. 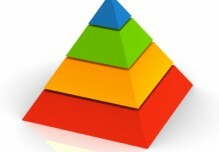 In this article, we will focus on what experts refer to as the Learning Pyramid. We will discuss both passive and participatory learning methods that maximize information retention among employees. Safety training often is delivered using the passive learning approach. Instructors typically lecture and use supporting materials such as informational handouts, PowerPoint presentations, video, and hands-on demonstration. As you can see by the average retention rates, a combination of the four methods provides for a greater level of retention. The challenge to the instructor is to incorporate participatory learning methods into routine safety training sessions. Using these methods will require adequate preparation prior to the training delivery. This may include up to two hours of preparation for each hour of training. As an instructor, there are days when you feel like you have to pull teeth to get employees to participate in training. This can be overcome by preparing for the class adequately and using small group exercises. For instance, divide the class into small groups of two or three persons. Provide them with a case study relating to the topic being covered. Consider using OSHA Fatal Fact Sheet scenarios from OSHA’s website, www.osha.gov, as the case study. The Fatal Fact Sheets summarize fatalities in the workplace for all types of industries and situations (mobile equipment, falls, scaffolding, confined space, lockout/ tagout, etc.). Case studies also can include incidents from the past, theoretical situations, or personal experiences. Provide the employees with the description of the task and ask them to identify the steps of the task, potential hazards, and the recommended safe work practices or controls. Each group can review their work with the larger group. Once all groups have discussed their efforts, review the outcome from the situation described in the Fact Sheet. Using this approach fosters teamwork, collaboration, and active group participation. The word practice is often equated to team sport participation. Teams can study the playbook extensively, but they will not master the playbook, until they hit the field and practice. The field is the work environment. There are many situations where we can practice what we learn in the classroom. For instance, locking out a complicated piece of equipment, entering a confined space, responding to a chemical spill, loading a railcar properly, and rigging a fall protection/restraint system are just a few. There has been a shift in recent years to the hands-on training approach. This approach, as demonstrated in the Learning Pyramid, provides for maximum information retention. However, just like in sports, employees can be injured during practice. Make sure that the practice scenarios do not place employees in danger. I once worked with a CEO who told me, “If you truly want to learn something, teach it.” He was right. In order to instruct on a topic, you have to know it inside and out. Consider the teaching-others method for your training. The possibilities for having employees instruct on certain topics are endless. In fact, in many instances, operations employees are more knowledgeable on how to work safely than the instructor is. Consider having your employees instruct or demonstrate some of the practice activities that were referenced earlier. You may even want to have them cover a particular example or real-life experience during classroom training. This can influence their coworkers greatly and increase their retention and awareness. In this article, we have discussed both passive and participatory learning activities. Work toward including participatory training methods into your routine safety training. Strive to get out of the classroom and into the work environment. That is where the real work is done. Our goal is to assist clients in creating an injury-free work environment thereby improving employee attendance, efficiency, productivity, job satisfaction and overall morale. We offer a broad range of services to help companies achieve their safety goals. Star of the West Milling Co. has been working with Progressive Safety for a couple of years now. We enjoy the third party perspective, which he brings and the organized formats he has helped introduce us to when reviewing and updating our Safety Policies. Progressive Safety has also done a great job introducing our various Safety Committees to the Job Safety Analysis process. Wayne Bauer – Safety Director, Star of the West Milling Co.